"I used to be able to deal with it. Now I can't swing it." In the ranks of "look at the bad things drugs can do" movies, Speed of Life (aka Saturn) is not a bad one, though it certainly doesn't rank up there with the to-the-bone chilling realism of true gems like Sid & Nancy or Requiem For A Dream. In this one, Scott Caan (son of James) is Drew Stein, a hard-working chap who fixes motorcycles, takes college classes and, most importantly, lovingly cares for his widowed father (Leo Burmester), who is ailing with what seems like a debilitating double dose of Alzheimer's and Parkinson's. Early on, we also learn that Drew is struggling to stay clean, having kicked his experimental drug days in attempt to get on the straight and narrow. It is a tough row to hoe for Drew, and the gentle, unflinching attention he pays to his father is the movie's emotional sweet spot, even when the situations (diaper changing, for example) are particularly uncomfortable to watch. The relationship between the Steins is a touching one, and one that is handled especially nice by Caan, whose character is completely unselfish in the nearly round-the-clock attention required to care for his father. Caan, who sort of looks like Sean Penn's distant cousin, does the likeable, dedicated son routine seemingly without effort, and as the film's lead he carries it well. 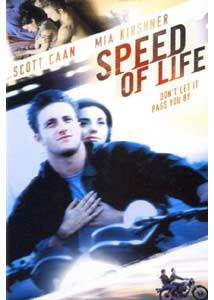 A drama without any jarring unpleasantness wouldn't be much of a drama, and Speed of Life introduces a dangerous love interest for Drew in the form of Sarah (Mia Kirshner). She is ridiculously cute, and apparently wealthy, judging by her fancy car and apartment, but she when she first meets Drew she is slumming for a drug fix. As a predictable plot point, Sarah slowly draws Drew back into the world of drug addiction, and that is when things begin to crumble for everyone involved. This is one of those films that when the final credits roll you might be left wondering just exactly what it was all about. The elements of a good story are there, but writer/director Rob Schmidt doesn't expand things sufficiently to justify some of the characters' unexpected actions. The intricacies of the plot are minimal, and somewhat slow-moving, though some of the drug trip sequences are very well done and make for some stylish, bad dream-like moments that try to convey addiction's ugly and hollow side. When the time comes for the first sexual encounter between Drew and Sarah, which in another film may have been portrayed with lusty and reckless abandon, it is instead depicted as a depressing and lonely experience. Image Transfer Review: A clean 1.85:1 anamorphic widescreen transfer from Lions Gate reveals a few minor specks, but by and large this is a decent looking print. Colors are primarily on the subdued side, accented even more during the stylistic drug sequences. Black levels aren't perfect, and some of the night scenes are rendered slightly too dark, with a bit of noticeable grain. Audio Transfer Review: For a film that is largely dialogue-driven, the 2.0 English surround track isn't a remarkably aggressive mix, but it does incorporates the rear channels a bit more than you might expect. Music cues and stingers serve to accentuate the drug sequences, and subtle front channel imaging expands the overall experience. Extras Review: Not much here other than a couple of trailers (Speed of Life, The Dead Zone television series). The disc is cut into 24 chapters, and features subtitles in English and Spanish. Speed of Life has some moving, understated moments, in addition to a well-telegraphed, but equally heart-wrenching third act, but not enough of a fully fleshed out story to really recommend this as anything but a potential rental. Anyone who has looked into the eyes of an ailing parent may find some of the situations difficult to watch, but Scott Caan's performance as the son forced to be caregiver is this film's real highpoint.